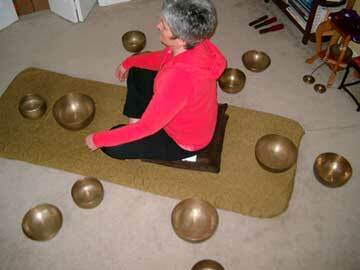 Singing bowls are a beautiful and powerful mystery. They produce the sounds of HU and AUM, the "sounds" of energy becoming matter. They alter space and time, awaken cellular memory, and have the potential to transform our energy bodies. The act of listening to the sound of a singing bowl stops one's internal dialog, making the bowls an excellent tool for meditation, centering, and relieving stress. Westerners have been fascinated by the singing bowls for decades, but little is known about them. The origin of the bowls is somewhat of a mystery and seems to be shrouded in secrecy. They are created from an alloy of seven metals that correspond to planetary energies �?gold for the Sun, silver for the Moon, mercury for Mercury, copper for Venus, iron for Mars, lead for Saturn, and tin for Jupiter. By utilizing these metals with the intention of connecting with these planets, the bowls actually serve as conduits for the associated tones, colors, and energies of these heavenly bodies. This combination of metals produces at least five individual and simultaneous tones in each bowl, each tone at its own consistent frequency. The vibration of the singing bowls synchronize with brain waves and create a therapeutic effect upon the mind/body by entraining the brain to move into Alpha and Theta states. When the brain goes into Alpha and/or Theta, the heart rate slows, the blood pressure normalizes, and tension melts away, creating an opportunity for the body to "heal" itself. Evidence suggests that the singing bowls originated during the shamanic pre-Buddhist period in the Himalayas, known as the Bon tradition. All of the bowls used by Danielle are the "real deal"—certified as ancient (at least 100 years old) and made by Buddhist monks. Danielle Dvorak was trained and certified by (and continues to learn from) Richard Rudis in the use of the Tibetan Singing Bowls and the Earth gong. She has been authorized by Richard to give individual instruction in the use of the singing bowls and also has access to an inventory of Richard's certified singing bowls. For more information on individual sound sessions with the singing bowls, please go to the "Sound Therapy" link on the homepage of this website �?or you may contact Danielle by email (Contact page) or by calling 847.323.9188.